It has been said that when the going gets tough, the hopeful keep going.That's because hope is the great activator -- in other words, people with it take action to realize their goals.But many times the daily grind can be a hope-killer, so Zig Ziglar offers a solution!Ziglar encourages us to spend five minutes every morning with "Staying Up, Up, Up in a Down, Down World, thus gaining the inspiration and encouragement needed to face daily obstacles.Full of hope-inspiring vignettes from Ziglar, words of encouragement from well-known leaders, and Scripture for meditation andprayer, this quick-read provides the motivation needed for meeting your goals and fulfilling your dreams. - Publisher Writing with humor, hope, compassion, and enthusiasm, the popular motivational speaker instructs readers in the art of tapping physical, mental, and spirital power, using dozens of stories and vignettes to get his point across. 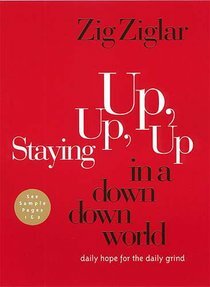 About "Staying Up Up Up in a Down Down World"
Writing with humor, hope, compassion, and enthusiasm, the popular motivational speaker instructs readers in the art of tapping physical, mental, and spirital power, using dozens of stories and vignettes to get his point across. Zig Ziglar, Chairman of the Zig Ziglar Corporation, speaks each year to hundreds of thousands of people throughout the world. His well-known I CAN course has been taught in over 3,000 schools and businesses. He is the author of several bestselling books, including Secrets of Closing the Sale, Raising Positive Kids in a Negative World, Over the Top, and See You at the Top.